On Friday evening Downtown Sarasota Interactive Community Art Project, Sarasota Keys kicked off a six month project. 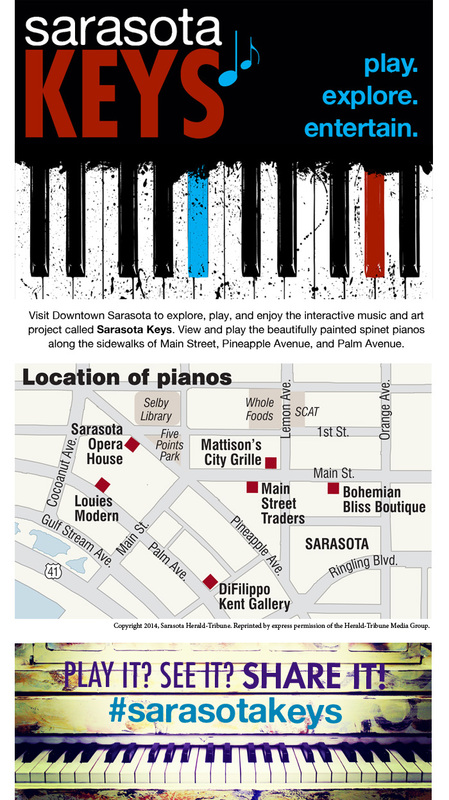 Six artists were asked to create a theme for each spinet piano, donated by Pritchard’s Pianos which will be dispersed at locations throughout downtown Sarasota. Last night after the kick off event at 5 Points Park, Danielle Furst and I headed out to Louie’s Modern for a bite to eat while awaiting the delivery of the piano that will be housed there over the next several months. What happened was magical. Several people took part in playing the piano, and to get it started, Danielle Furst; a pianist who not only grew up going to work with her father who owned a piano store, but a trained musician who now writes film scores, plays by ear, sings and can pull in a crowd with her passion for the ivories. Several people walking along the street sat down either with her or on their own and took a moment to play on the corner of Palm Avenue under the stars. If you want to take a seat at the piano or just watch others, head to these locations; Sarasota Opera House, Mattison’s City Grill, Bohemian Bliss Boutique, Main Street Traders, Louie’s Modern, DiFillipo & Kent Showroom. Pianos are rolled out in the morning and placed back inside in the evening and when it rains. To follow what’s happening, check out Facebook.com/sarasotakeys. Meet the artists at www.SarasotaArts.org. Dan Starostecki out with his family, stops so his daughter could tickle the ivories. Steven Strenk is the artist who created this piano theme, Danielle Furst brought the piano to life and Dayle Hoffmann enjoyed the magic. Pritchard Piano’s donated all six pianos. Dave Pritchard sits with Danielle Furst for a bluesy tune while Martin Price of ABC 7 catches it all. Dave Pritchard and Danielle Furst creating impromptu music. Danielle Furst interviewed by ABC 7’s Martin Price. 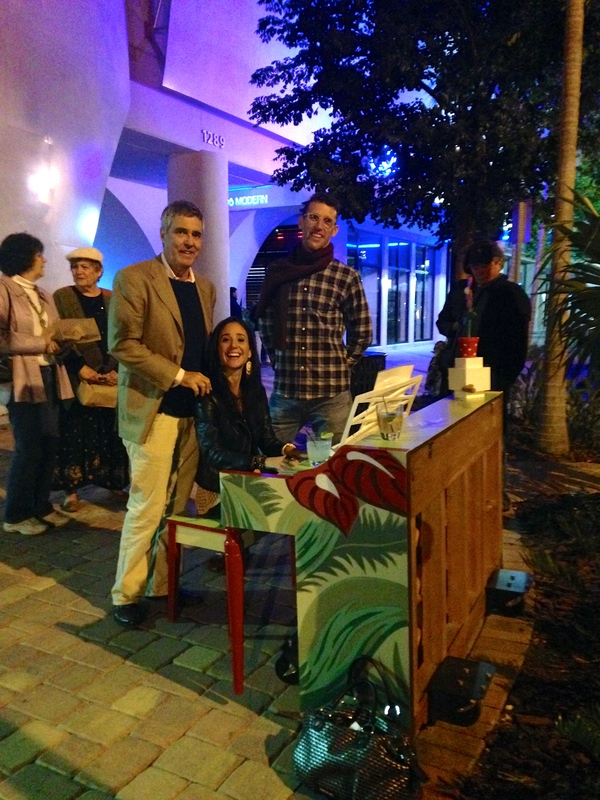 Stephen Seidensticker, owner of Louie’s Modern with Steven Stenk, piano artist and Danielle Furst, musician.